QUESTION: Which of these horses has Cushings? Cushing’s disease in horses is caused by a progressive degeneration in a part of the brain called the pituitary gland. It is a different disease process to the Cushing’s we see in dogs. This degeneration leads to an increase in the hormones ACTH and cortisol. Put simply, it is the increase in ACTH which causes an increase in cortisol. Increased cortisol then causes blood sugars to rise, which in turn causes insulin to rise. High levels of blood sugar and insulin are what triggers laminitis. Due to our current understanding of the disease we now call Cushing’s disease PPID, which is an acronym for Pituitary Pars Intermedia Dysfunction. It is a degenerative disease meaning it will mainly affect older horses, although it has been found in horses as young as 7 years old. Horses as young as 4 years old have been diagnosed with Cushings due to a tumour, not the more common pituitary degeneration. Although we cannot cure the disease, we can manage it well with a drug called pergolide (PRASCEND®). We have many patients who live a happy and normal life on a controlled dose of pergolide. Diagnosing PPID involves one quick blood sample. We measure the ACTH levels in your horse’s blood. The results can then be interpreted by your vet and the best plan of action initiated for your horse. If your horse has laminitis caused by Cushings and we do not control the Cushings, we cannot control the laminitis. 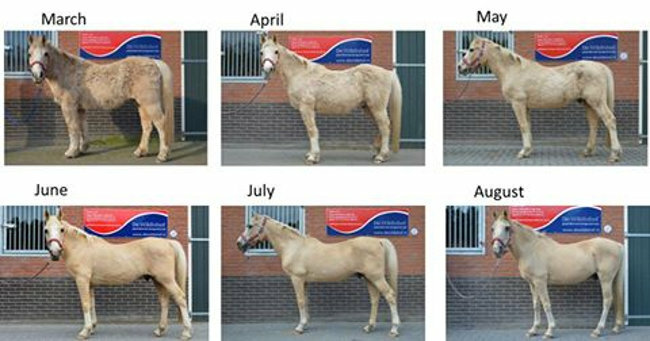 It is the hormonal disruption, as described above, from Cushings that triggers the laminitis. Liphook Equine Hospital offer a free Cushings test usually from Spring to Autumn each year. Your vet will inform you when this is and it is advised to test any horse or pony that may be showing signs of PPID. The free test can only be used once; a visit, time and postage and packaging will still be charged. A very good source of information is the website: Talk About Laminitis. There is a lot of information about laminitis, Cushings and EMS, including videos and pictures from veterinary medical experts. They offer a free monitoring service so you can log and track your horse’s ACTH levels, see the Care and Connect tab on their website to get started. If you have a horse with laminitis, Cushing’s or EMS we do recommend you check out the Talk About Laminitis as it is a reliable and up to date source of information. Some horses and ponies can be affected by both Cushing’s and EMS, so please refer to our EMS advice sheet for more information.